I came across funky vintage children’s reference books recently – I was drawn to their colorful spines. They were published in 1953. A flip through one of these books is like taking a ride in a time machine. 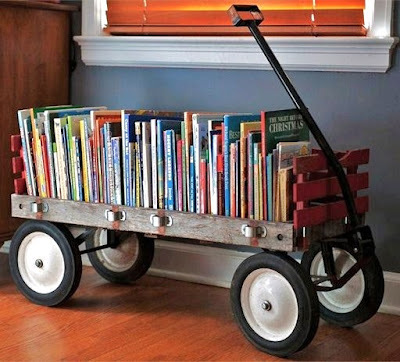 An old library cart tugs at my heart – I’ve always loved libraries! Though this example isn’t from a kid’s room, I just LOVE this idea, and think it would be perfect for a vintage-inspired room. I think any of these storage/display options would look cute with colorful books and vintage accessories. 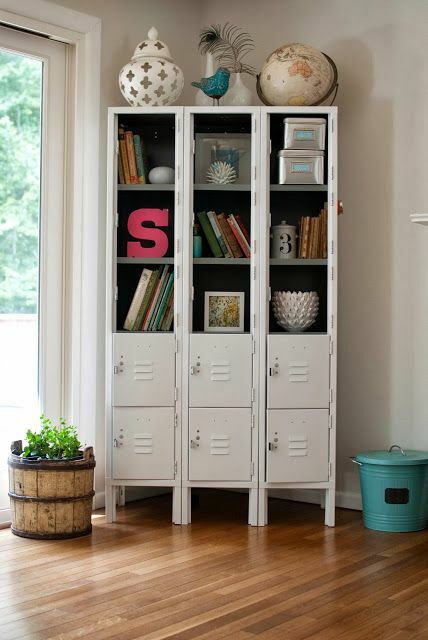 I’m now on the lookout for a vintage library cart or vintage lockers for Baby Boy’s room. (One of these days it will get that makeover I’ve been dreaming of!). The set of colorful vintage children’s books is available in the Pursuing Vintage Shop!